Where Is the Church in Pregnancy, Miscarriage, and Birth? I’ve had the feeling myself and I’ve heard it expressed among a lot of friends. “Where is the Church during …?” At the most difficult or the most profound moments of our lives, we want…something. Something official that shows that these huge and life-altering moments are recognized by the body of Christ. We want support, guidance, love, concern, and help and it makes sense that we expect the Church to provide that. Considering my own current state in life as a young(ish?) mom and a birth and bereavement doula, it makes sense that I most hear it in regard to the seasons of pregnancy or in regard to birth or miscarriage. Why doesn’t the Church do more for pregnant women? Does the Church care about me as I get ready to have this baby? Why aren’t there official resources to help women after a miscarriage? If the Church is so pro-life and claims she values every single human person, then how does she show it for these very real babies? The truth is that it’s there, at least to some extent. The problem I see is not that the Church isn’t recognizing the importance of these moments but that most people haven’t been told what is available, spiritually speaking. More importantly, most priests either haven’t been properly formed to know what they can do for families in these situations or they just haven’t done an adequate job of reaching out with these spiritual aids when a family does. It seems that in many cases it is up to the laypeople to know about them and ask for them. When a woman is pregnant there is a specific Rite for the Blessing of a Child in the Womb that recognizes the humanity of the person within her and asks for God to bless and protect him or her. Any pregnant Catholic woman can request it. Before birth, the Church provides a special Order of Blessing of Parents Before Childbirth. There is also a specific Order of Blessing of a Mother Before Childbirth that includes asking God for strength at the hour of birth and for “holy joy” before and during the birth. What a beautiful way to acknowledge the beauty of birth and the importance of the mother’s heart and experience of it! These blessings can be done by a priest or deacon but in the absence of them, can also be done by a layperson. Parents are also free to use sacramentals of the Church during birth – holy candles, medals, icons, a crucifix, holy water, a rosary and more can all help infuse the moments of birth with grace. A woman undergoing a planned cesarean surgery may also licitly receive the Anointing of the Sick from a priest as it is considered major surgery (Catechism of the Catholic Church, 1515). Then, of course, there is the encouragement and obligation of the parents to bring their babies to receive Baptism soon after birth. So important is their soul that the Church requires it to be done “within the first few weeks” (Canon 867.1). Included in that most important of all sacraments is a blessing bestowed separately on the mother and the father as they enter into their parenthood. When a child has tragically died in the womb, the Church encourages a funeral Mass and Christian burial for that baby. The prayers used should be taken directly from the Funeral Rites for Children from the Order of Christian Funerals. Parents undergoing this loss have EVERY right to request this from their priest and expect that their baby receive the same treatment as any other member of the parish. Unfortunately, many priests are simply unaware of or are rarely asked for this incredibly important service that honors the dignity of the child and the grief of the family. And, of course, many priests simply can’t even know when one of the women in their care has experienced a miscarriage unless the family tells him. In many dioceses there is cemetery space owned by the diocese that is set aside for miscarriage and stillbirth, often free of charge. 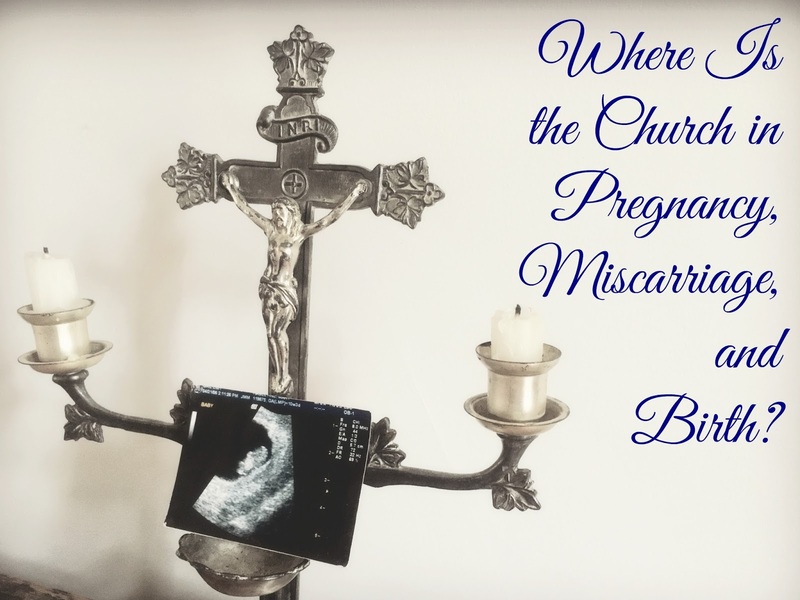 After a miscarriage or stillbirth, the Church also provides a Blessing of Parents After a Miscarriage or Stillbirth that can be offered by the priest or requested by the parents. Many dioceses or parishes also have an annual Mass for parents who have suffered a loss. While much work needs to be done to give greater emotional support and practical help to families that are enduring loss or who need practical help and support as they welcome new babies into the world, the spiritual helps are there and available if we know about them. Perhaps, it is we as laypeople that need to do a better job of providing not only prayers and spiritual support for our brothers and sisters but also take more responsibility for providing that practical support as well. The church should be honoring and helping new mothers and fathers who are postpartum and overwhelmed. The church should be acknowledging the grief of those who mourn their little ones and providing meals, comfort, and acknowledgement of their loss. But that church is us! The official Church provides the supernatural help but it is primarily up to us the laypeople as the body of Christ to be providing that practical help. This might be through organized international or parish ministries or it might be through parishioners and friends informally rallying around a family in their time of need. Joining or founding an Elizabeth Ministry Chapter in your parish can be a beautiful way to bridge this gap, and to be the visible church reaching out to embrace those experiencing infertility, miscarriage, stillbirth, bedrest, and all the many joys and sorrows of the childbearing years as well as a way to educate fellow parishioners on the resources and rites available to them before they are needed. Meal organization for new parents or those who are suffering loss, cleaning and babysitting for postpartum families, help for mothers and families during difficult pregnancies, emotional support for postpartum mothers and grieving families…those are all ways that we as the body of Christ can show that we truly value every single life. Where is the Church? When parents are struggling with the grief of loss or the realities of new parenthood, the answer to that question should be that not only is it here in this building and in these prayers but it is also all around them.